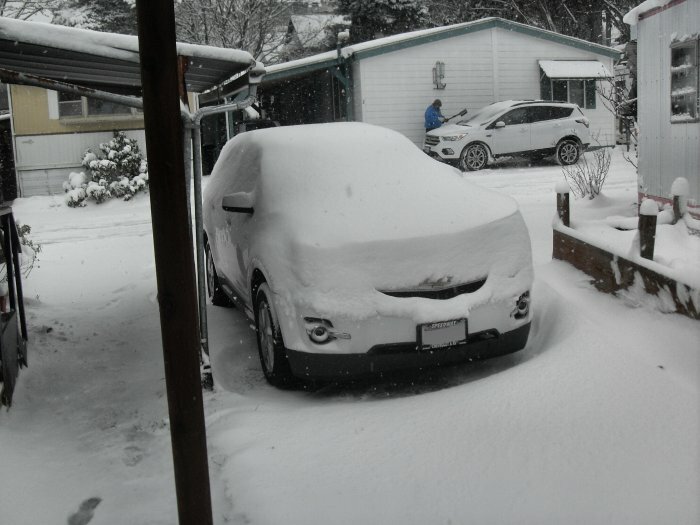 Especially in the Seattle area, the prediction for heavy snows in the northwest area is slated for this weekend. Hunker down and stay safe. At their ages, and medical infirmities, they couldn't do much of anything else. Snow has lost its charm on them as far as doing anything in it or with it. Watching will be the extent of their involvement. Last time I saw and felt fresh snow was in St Petersburg (LED), 15 years ago early in 2004. Different climates, different expectations and concerns. Just cleaned off my truck and Patti's car. About 10 inches of snow. 3 to 4 inches on the ground and 30 degrees F outside. I guess I was too late with my warning...OK Ric, tell me how you can get 10" of snow and only 3-4" on the ground. What does the snow do, go back up into the sky? I knew it's weird on the left coast...Everything is backwards. Joe, I couldn't tell ya. All I know is theory. Car roofs are higher in elevation than the ground so they accumulate more snow, ya know!? Makes sense to me!!! I would say the ground is warmer than the sheet metal of a car roof or hood unless the engine is on. The snow on the ground partially melted compacting it. At my place have a deck here on the third floor. Snow landing on it is due for a long stay since the air temp on top and bottom on the deck is essentially the same and there is always more snow on the deck than on the ground. We also use lots of salt up here so people can move around so that helps. 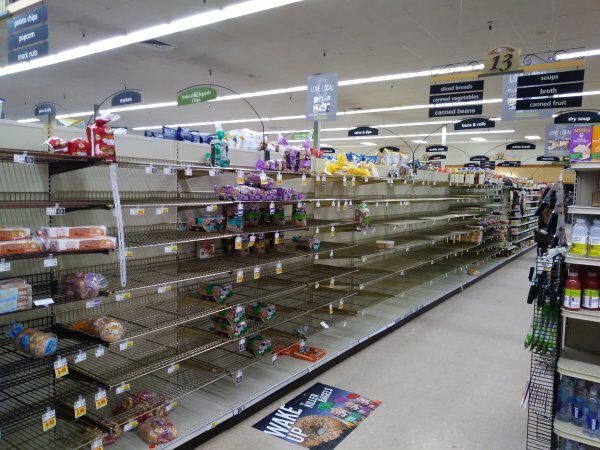 Well, someone must have believed you Joe.Took this photo of the bread aisle at the local QFC about 1/2 an hour ago. Never seen the shelf that empty before! Started snowing again about the time I left for the store. Coming down pretty good right now. Anyone checked on that old pharte of a Westcoast CPO yet? Knowing him he'll be out in that snow with his head tilted back trying to catch snowflakes on his tongue and wind up getting himself lost. Ralph, I tried him a while back and could not get through with any phone numbers I had for him. 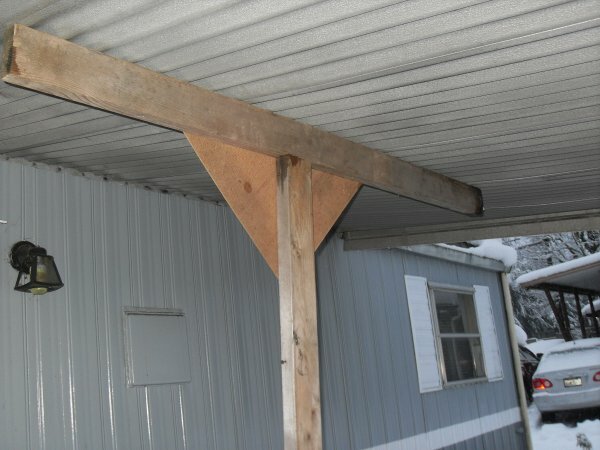 Just finished putting a brace under my awning roof over the front steps so it wouldn't collapse under the weight of the wet snow. I had to do this about 7 years ago with another heavy snow. Thanks Ric! Hard telling where he'll turn up at. Clear is doing fine. Talked to him yesterday. He is staying hunkered down like everyone else out here with all this white sh*t on the ground. Ba Hum Bug!!!!!!!!! Thanks Dan. Good to know. I wouldn't want to slip and slide down is hill. On the local news last night they had a West Coasty standing out on a pier in the middle of a snow storm fishing. Now that guy was hungry. Walt, I wouldn't be surprised if that wasn't that worn-out old pharte of a West Coast CPO. Possibly we will have to make some derogatory remarks about EM's to get his juices flowing. It used to work well in the past. Isn't much fun when folks shutdown. Makes one careful what one says, incase they have left on final patrol and you haven't been informed. The worst call I ever made was to an old friend I hadn't spoken to in a month. I got his wife and she said he had passed, and that he had been wondering why I hadn't called recently. Yes, I've been in the same situation. A friend of mine left out on FBM patrol a month before we did. When we got back I saw him in the Acey-Ducy Club and asked how his wife was doing and he replied she was dead. A real bummer since we were only in our early 20's. I'd be proud to have your new number. Call me if you want. It's nice to know you're still around and kicking up some dust. Here in Charleston we don't put up with that white crap called snow. It is a 4 letter word for a reason. Just let folks know you are still alive every once in a while by posting something. Otherwise we might reach the wrong conclusion as to your whereabouts. In other words, we ain't gonna know from the local obits if you are alive, only the bad news. So keep some of the good news coming.